Featuring: Articulating head for superior maneuverability and a patented filtration system. 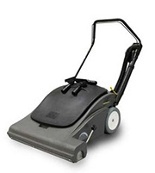 Featuring enclosed bag-in-bag filtration system, six brush height adjustments, and built-in brush suspension system. Featuring a filter funnel, a two-tank system with transfer pump, quick heating, and optional transport cart.